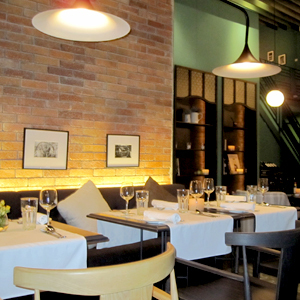 The atmosphere is a little New York warehouse and the food is a little French with dishes prepared by a Thai Chef (educated at Le Cordon Bleu, Paris.) Start with Crab Cakes, Cesar Salad and Horseradish, then move on to the Spaghetti with Seared King Scallops and Truffle Cream Sauce. If you're feeling more turf than surf, the steak isn't half bad. Take at taxi from Asoke or Prom Phong BTS Station, turn into Sukhumvit 31 (Soi Sawasdee) Fat fish will be on the left.